Laurie Here - Contemporary Fiction and MORE - Book Reviews: Blogging from A to Z Challenge - April 2012 - It BEGINS! 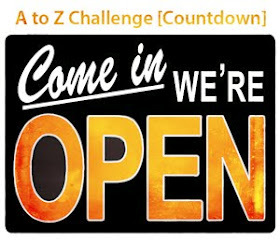 Blogging from A to Z Challenge - April 2012 - It BEGINS! I'm SO excited! I've been waiting for this and now it's here! You can go to that link and see SO much MORE! You will also be able to see ALL the other blogs that are participating in this Challenge as well! I encourage you to visit that blog, as there is SO much MORE information there in addition to what I even write! It's amazing! An ENTIRE blog devoted to this Challenge, and this Challenge alone! I really hope YOU enjoy this as much as I will/am! Each day I will post according to this calendar! I will have my Posts UP BY NOON each day. I'll have to make sure the 'rules' allow for noon and if I 'do' get the chance to post earlier, I will. I have a SPECIAL TAB AT THE TOP FOR THIS SPECIFIC CHALLENGE. Each day that I post, I will Post here, on the HOME page, the letter and the subject. This is what you will receive each day. If you would like to come on by and CLICK ON THE SPECIFIED "LINK" FOR THAT DAY, OR ON THE TAB ABOVE that says "Blogging from A to Z Challenge - April 2012", it will take you directly to my Post for that day! I would like to request COMMENTS from you!!! I really would LOVE comments! I want feedback to see what YOU think about the subject matter I write about, and more! This is the FIRST TIME I am 'committing to writing EVERY day"! So this is a NEW thing for me! Comments can be left after the post on the dedicated page! There IS a GIVEAWAY for the person with the MOST POSTS! Keep reading to learn MORE about it! 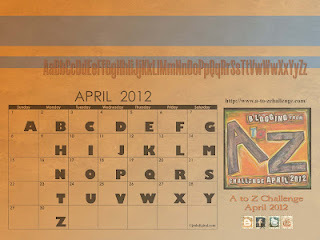 ALL about the "A to Z Blogging Challenge - April 2012"! I AM a Book Blogger, of course! This is what I know and LOVE! Books, Blogging, writing reviews and SO much more! So, PLEASE CLICK THE ABOVE TAB TO READ MY ARTICLES each day, or click on the highlighted LINK below! You will have to scroll down each day to go to the letters of the alphabet, because of course I am starting with the letter "A". I want to keep the letters in order, which will require you to scroll down. THANK YOU SO VERY MUCH FOR STOPPING BY, AND DON'T FORGET TO LEAVE COMMENTS after each post! I would really like to request YOUR SUPPORT for this Challenge for EVERYTHING I WRITE ABOUT, in the form of comments! PLEASE!!! I would LOVE to know what you think about what I am doing, if my articles are interesting enough and if I have given enough information! Also, if there is ANY information I may have missed on a topic, please feel FREE to leave your comments! Please do so to benefit ALL the Readers here! ANY type of comment you have is WELCOME AND APPRECIATED! I would LOVE for this to be VERY interactive! ONLY YOUR comments can make this happen! I really look forward to your them! Okay - enough about that! Thank you! See you EVERY day for the MONTH of April, 2012! Now, I have to go write my Post! Thank you SO much for your support in EVERY FORM, especially by leaving comments for me every day, if you get the opportunity to! Cyber hugs to ALL my followers and to ALL my NEW followers! I hope you enjoy ALL that I have to offer in the way of the articles I write! I've been working for the last month getting ALL my topics organized! Here' to YOU! THERE WILL BE A GIVEAWAY OR MAYBE 2 OR 3, DEPENDING ON THE BOOKS I HAVE AVAILABLE AT THE END OF APRIL, ONCE THIS CHALLENGE IS COMPLETE! WOO-HOO! Whoever leaves the MOST comments WILL win a book or books! Now go on over to the highlighted link above! Leave a comment! Thanks again! PS. If you'd like to give follow me via "ALL" the ways you can or prefer, I would LOVE it! I will try to make SURE I follow back! They are "ALL" on the Right Side-Bar! Thanks again! Thanks, SherryE for stopping by and leaving a comment! You have an entry to WIN A BOOK OR BOOKS! I really appreciate your stopping by to support me with my A to Z Blogging Challenge! It means a LOT! I hope you stop by ALL through April! An entry EVERY time you leave a comment! Everyone gets 1 entry everytime they leave a comment! Thanks, too, for wishing me luck with this Challenge! It IS quite a challenge to Blog EVERY DAY throughout the month! I'm sure, though, I can find something to say! I do LOVE to talk! I was born conversing AND with a book in my hands! LOL! Are you in this Challenge, too? If so, stop by again and leave your blog addy! Would LOVE to stop by and see what you are writing about! There are OVER 1,700 Blogs participating in this Challenge! That is an unbelievable number, isn't this! Wow!